Georgian President Mikhail Saakashvili was aware of Vladimir Putin’s intention “to hang him by the balls” during the armed conflict in the Caucasus in August. Saakashvili, who arrived in Paris Thursday for a meeting with his French counterpart, confirmed that he knew about the notorious conversation, which supposedly took place between Nicolas Sarkozy and Vladimir Putin. When journalists of a French radio station read out Putin’s threat to Saakashvili, the Georgian president responded with a nervous giggle. “I knew about this scene, but not all the details. It’s funny, all the same,” The Times quoted the Georgian leader as saying. It was previously reported that Nicolas Sarkozy had talked Putin out of the plans to overthrow Saakashvili’s government in August. The dramatic conversation took place in the Kremlin August 12, Nouvel Observateur wrote. 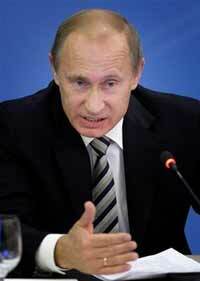 Putin is known for his street language, which he may often use in his official statements. A French journalist asked Putin an unpleasant question about Chechnya in Brussels in 2002. “If you are so eager to become an Islamic radical and are prepared to get circumcised, I would recommend them to carry out the operation in a way so that nothing grows back for you,” Putin responded. In 1999 Putin swore that Russia would persecute Chechen terrorists everywhere. He particularly promised “to crack them down in outhouses.” Putin’s population rating exploded after the remark, sociologists said. Most Russians were probably waiting for such harsh statements from their leadership after a series of bloody terrorist acts that rocked several Russian cities and towns in September of 1999. A car bomb killed 65 in Buinaksk, an explosion of an apartment building in Moscow killed 109, an explosion of another apartment building in Moscow killed 118, an explosion in Volgodonsk killed 19 people.